It's the kind of service that is rarely provided in Maine even as the number of pregnant women addicted to opioids has soared. In part four, the final in our series "Recovery in a Small Town," women are getting help coping with the combined stigma of being addicted and being an addicted mom. 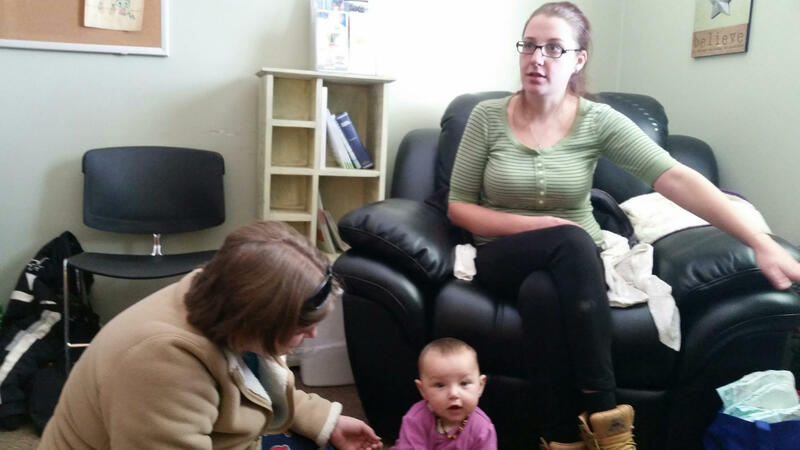 Rachel and Danielle with baby and counselor Mindy Butler and Terri (l. to r.) at North Bridgton Family Practice. The bi-monthly women's meetings at North Bridgton Family Practice are facilitated by a counselor who has them start off by doing a check-in. The women asked that we not use their last names. "I'm Beth. I just had a surgery, supposed to get rid of kidney stones but they couldn't do it. I did good, though. I had a prescripton for paid meds and didn't get them filled." On this day there are four women in the group. They talk about kids, relationships, the triggers they need to avoid to stay sober. They're all mothers who are taking Suboxone to treat their opioid addiction. Most have been taking it for several years. Danielle started taking a version of the medication called Subutex when she became pregnant. At first, she says she didn't like the idea, but her doctor convinced her that the medication was better than using heroin and other drugs or going into withdrawal while pregnant. "You know you need to do this to have a healthy baby," says Danielle. "But there definitely is a stigma attached to it." Danielle, who has brought her baby to the group session, says she feels that shame every time she's late getting to treatment, late dropping her older daughter off at school and an attendance taker asks her why. "I think the number one thing when you're pregnant or even you have children when you have an addiction is the fear of what could happen, you know what I mean?" says Terri. Terri is a mother of four kids who says she lost a house, two jobs and custody of her children to her addiction. Losing her kids, she says, was her worst fear and a big reason she did not ask for help until it was too late. "If I had known of Suboxone, that there was an option to go to a doctor and say, 'I need help managing my opiate addiction I — the road my family went down could have been a straight line," she says. "I took a Suboxone, the entire urge was gone from my brain and the sickness and that was gone. That was six years ago." Terri is now living with her children at her mother's house. Her husband is currently in jail out of state for what Terri says is the "umpteenth time." And while she's doing well in recovery she has a conviction for distributing cocaine on her record. And she says that felony is a barrier to finding work and being able to support her kids. "If I go in and apply for a job they're gonna see that," she says. "They're not gonna know how many years I did what, or whatever. They're gonna look and see, 'Oh, this girl...'"
"And it's kind of like a catch-22, like you need to get a job but then, like me, like stealing," Danielle says. "Well, I can't get a job 'cause I have stealing on my record but my kids need things so maybe, I mean I'm not, but maybe I'm gonna go out and steal some more." Danielle says her charge stems from the period right after her first child was born. Her partner got arrested for breaking into houses and stealing drugs. She was left with no resources and says she got caught stealing baby clothes at the Maine Mall. The women say these crimes should not doom their chances of finding a job, especially after being sober for several years now. For those who do have work, the rigorous demands of daily counseling sessions three hours a day four days or five days a week can be hard on an employer. And some employers are also unforgiving about failed drug screens, even if the drug is a prescribed medication. "If somebody's working, that's so good for their recovery, you know, so why take that away?" says Mindy Butler of Crooked River Counseling. She is in charge of the women's program. She says she tries to be sensitive to people's work schedules and to child care issues when she's helping them arrange treatment. "I've found especially with moms, single moms, they might not have a safe place to put their child, says Butler. "They might not have the money for the child care and those sorts of things, so this just really opens an avenue where they can keep their kids with them, still get the treatment that they need." Butler says research shows that women often do better in recovery when they're in women only support groups where they're free to discuss sensitive issues like domestic violence. Danielle says she was initially skeptical of coming to the women's group. "I was like, I don't want to go with a bunch of female, drug addicts in the town that I grew up in and talk about whatever," Danielle says. "And then I came and I was all nervous and by the time I left I was like, that was way better than individual counseling. It just works. It's great. I love it." Rachel, who's only been in treatment for about a year, says she's also benefited from the group and she has this observation, "I think that after you get on the road to recovery you're so much more capable of loving your child and being a good mom," she says. And that, say the women, is why programs like this one are so desperately needed across Maine.